(Sugar Land, Texas, Sept. 16, 2016) - The Sugar Land Skeeters clinched the second half Freedom Division Title with a 6-5 walkoff win over the Southern Maryland Blue Crabs on Friday night. The Skeeters wrap up the regular season with two more games against Southern Maryland on Saturday and Sunday before hosting York Revolution in the first round of the Atlantic League Playoffs. 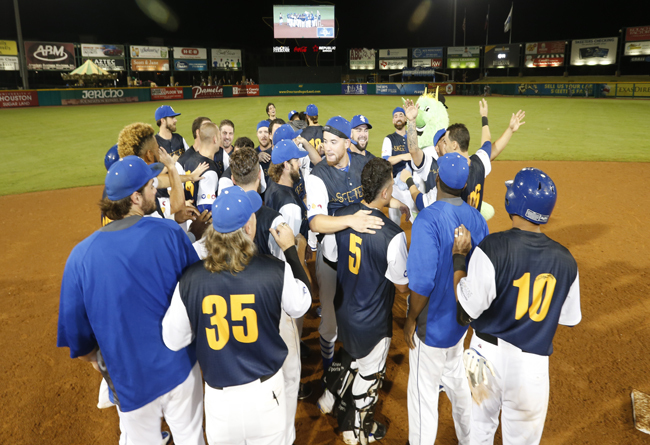 The win marks the 3rd time the Skeeters have reached the playoffs in franchise history after reaching in 2013 and 2014. The Blue Crabs opened the scoring with a three-run homer from Michael Snyder. A solo homer from Wilfredo Rodriguez helped the Skeeters cut the deficit to 3-1 in the 5th. Rene Tosoni’s solo homer and Lance Zawadzki’s RBI single in the 6th tied the game back up at 3-3. The Blue Crabs took a 5-3 lead into the 8th but Delwyn Young responded with a two-run shot that tied the game at 5-5 in the bottom of the 8th. With the bases loaded, Lance Zawadzki pushed the winning run across with an infield single that scored Ricky Hague to give the Skeeters the 6-5 victory. For more information about Atlantic League playoff tickets and how to purchase please call the Skeeters box office at 281-240-4487 or visit the Skeeters website at sugarlandskeeters.com. Led by former Major Leaguer Gary Gaetti, the Skeeters play at Constellation Field, a state-of-the-art stadium located at the intersection of State Highway 6 and U.S. Highway 90A in Sugar Land. The Skeeters play 140 regular season games in the Atlantic League, which offers an open classification of play.